A new product being funded on Kickstarter, Arsenal, aims to simplify the process of capturing images using a DSLR or mirrorless camera by utilizing artificial intelligence. The system is composed of a hardware component that sits on the hotshoe and connects to the camera's USB port, as well as mobile apps for iOS and Android that communicate via WiFi or Bluetooth to the main unit. Among other things, Arsenal chooses ideal camera settings for a particular scene based on what it has learned from thousands of similar existing photographs. Arsenal was created by engineer and photographer Ryan Stout as a way to quickly shoot 'amazing images' in any condition, and without having to manually adjust the camera's settings. 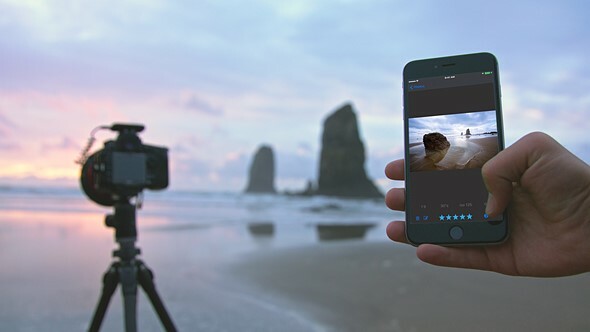 The related mobile app provides total control over the camera, as well as one-tap access to an AI assistant - trained from a database of millions of photographs and their metadata - that chooses optimal settings based on the scene in front of the camera. The software then goes on to refine its chosen settings based on 18 environmental factors. It even takes vibrations into account, thanks to its highly sensitive accelerometer. Photographers are given a live preview of the scene through the mobile app, as well as manual control over aperture, ISO, and shutter speed. You can focus by tapping on your phone's touchscreen as well, or tap multiple points and Arsenal will ensure they're all focused. Arsenal also supports advanced camera functions, like automated photo stacking for HDR images, focus stacking, long exposures without the need for ND filters, and time lapse creation. The resulting Raw files are saved directly to the camera. Images on your camera can be viewed, even at 100%, directly in the app. From there you can instantly share to social media using your phone's social sharing capabilities. You can even rate images and enter Lightroom compatible notes, and they'll all show up upon import. Arsenal supports cameras from Canon, Nikon, Fujifilm, and Sony; photographers can input their own camera on this page to see whether it is supported. The camera assistant is currently being funded through Kickstarter, where the $50,000 goal has been exceeded with nearly a quarter-million in funding. Backers can get a Kickstarter Exclusive Arsenal by pledging at least $150; shipping is estimated to start in January. Our gallery below explains more about Arsenal's features. View full-screen for captions. Intelligent camera assistant wirelessly controls DSLR and Mirrorless cameras from a smartphone, uses machine learning to find optimal settings in any conditions. BOSEMAN, MT—May 23, 2017—Arsenal, a camera technology startup, today announced the world’s first intelligent camera assistant powered by machine learning. The new hardware and software product, launched on Kickstarter, enables photographers to wirelessly control their cameras and quickly perform advanced techniques. Arsenal’s artificial intelligence (AI) is powered by a series of machine learning algorithms trained on a database of millions of photographs and their metadata. By comparing new scenes with its database and adjusting based on environmental variables, Arsenal enables photographers to get the perfect shot every time. Arsenal will serve the growing market for Digital Single Lens Reflex (DSLR) and Mirrorless cameras. Its initial product will be compatible with dozens of popular models made by Canon, Nikon, Sony, and Fuji. In addition to its AI capabilities, Arsenal gives photographers control over their camera from up to 100 feet away. Users can adjust settings, watch a live preview, and trigger the shutter remotely from their smartphone. Arsenal also simplifies several advanced photographic techniques. Arsenal will perform photo stacking (the process of combining multiple photos for more dynamic range or sharper focus), long exposures, and timelapses. In each case, the resulting RAW files are saved directly on the camera. The Arsenal app also includes powerful photo review capabilities. Users can wirelessly browse the photos on their camera’s card and view individual RAW files in full resolution. Photos can then be shared directly to Instagram, Snap, and Facebook. The Arsenal system, which is currently being tested in the field, consists of two parts: an ultralight hardware device that sits on top of a user’s camera, and an iOS/Android mobile app. The app wirelessly communicates with the device via wifi or Bluetooth, which in turn controls the camera via a micro-USB connection. Backers of Arsenal’s Kickstarter campaign will be the first to receive the product, which is scheduled to ship in January 2018. For more information on Arsenal, the intelligent camera assistant, visit https://witharsenal.com. Why hasn't Nikon or Canon just added this kind of software to their $2000+ camera bodies? Does this software engineer write better algorithms? I would like to have joy and fun by manual adjust my DSLR to make a little creative images. Don't like the preload program. Well, ours probably got "lost" in the post. We have been writing to Arsenal for over a month now and all they tell us is that they can only give us a refund once they get the Arsenal back. Is that my problem? I don't even want it any more. What kind of company policy is that? Shocking!! I ordered mine over 6 months ago and have never got as much as an update. Any suggestions??? Terrible connection issues with iPhone X/ios12 or iPhone 7/ios10, takes 7 or 8 attempts to connect then fails to see the camera when it does finally connect, so repeat. when connected, everything is so slow. Single point focus takes 10-40 seconds for example. Focus stacking doesn't seem to work at all, multipoint focus takes around a minute and a half with two focus points, then crashes taking shot 1 of n.
This kills my camera where the only way to turn it off is to remove the battery. I know this is a new product and I expect some bugs, but this isn't something you can charge people money for at this stage IMHO. I hope this is just me with a bad unit - anyone got one working yet? They have been shipping these out to buyers already, it's time for an updated review on this. Did you get your's yet? If you did have you tested it out? Disregard that $ sign at the end of my post . TYPO. I’d be concerned about now regarding shipping, if you look at his,posted advert on Facebook it’s been put back by the month-we are now at May with a statement that towards the end of May shipping would start, hello, we are at the 27th May and still no shipping. it says it fits on the 1D MK IV. But needs a hot-shoe and this camera doesn't have a hot-shoe. How to fit it on it then? It doesn't 'need' a hot shoe. While it can sit on the hot-shoe for convenience, it plugs in to the camera via a USB data cable. This just means that for cameras without a hot-shoe, you would need to secure the device somewhere else. I hope DPR does a review of the actual product when released.
" (If I want a picture of a sunset, I can just download it.)" If I want a picture of portraits of people, I can just download them too. Why even continue to take photos? Everything has been photographed in the world. I remember the matrix metering days and the new auto focus feature arrival and thought it a gimmic. That was the last time. My clients expect me to photograph architecture,food decor flowers happy people and more all in a 3 house period. I live and die by quick focusing and good exposures on the fly. If stacking and other “helps” along the way save time on the back end edit here here. If I know it will be exposed well I will have all the more freedom to shoot more variety of images. I look forward to Seeing how this device helps me. I'm with you... I just ordered one. I can take great nature shots all day long but sometimes I forget to move back a setting and miss a shot. The cameras now have more options than I know what to do with so if there is something that can help narrow my choices and allow me to be more creative, that would be awesome. The art and skill will be lost? I don't think so. Yes, this is an advanced auto-mode with deep machine learning. Why do you think latest generation smartphones DO take better pictures in the hands of an amateur than if you gave the same person the top of line DSLR or mirrorless? Being still new to interchangeable lens - see this as an accelerated learning tool, that appears to make make recommendations and set the knobs, based on the experience of millions, but also lets me adjust the knobs as I need to. Still the art is in the composition and that will likely still be human driven, until the drone take over. Also it would be interesting to see how it works in handheld app free mode. Vs. tripod w/ smartphone app mode. Other than landscapes and astro I think most will still shoot handheld. Providing feedback via the camera EVF/OVF and LCD would be limited by the camera UI itself. Even so if it makes for smarter auto-mode, and better auto-HDR stacking (than in-body HDR), then this can be well worth it on it's own. Neural networks and machine learning are extremely helpful and interesting in countless scientific applications but this is just lame... what's next, a camera-copter which flies to location and takes all the pictures for you without you leaving your seat? where is the fun and creativity in this? what about the subjective mind and interpretation of the photographer? this is idiotic to say the least. People probably said the same thing when they first put exposure meters in cameras. Just not the same as estimating the EV level and setting the exposure yourself. Probably said it again when cameras became able to set aperture and shutter automatically based on the meter reading to save you the trouble. And again when auto-focus came about and again when stabilized lenses and bodies reduced the need for tripods. It's jut no fun anymore not lugging them around! Seems to me this program is just another step along the way of automation. Most dslrs have some form of matrix metering that try and analyze the scene albeit in a much less sophisticated way than this so if you use that and happily let the camera meter scenes and focus etc I am not sure I see your objection. All poor comparisons. None of those innovations stopped/stop you from being creative. Today the photographer still controls the creative process even if we're only talking about a lousy snapshot. This is one step in a completely different direction. This is artificial intelligence making all the decisions and taking the photo for you. Seriously, what do we want? do we want to be completely substituted by a machine? where could possibly be the gratification in that? Don't get me wrong, I do admire what's inside this gadget, I've worked with machine learning myself and this is fascinating, yes, but purely from a scientific perspective. For all those deriding this (...almost all of you extremely competent photographers, surely...) I will point out this: The focus stacking with in-device merging into a single Raw functionality alone is worthy of some interest. PT Barnum is alive and well. So basically it gives you features that should be built into DSLR's anyway! Great stuff. It's kind of like the idiot modes in a DSLR, but on steroids. There are plenty of software programs that already can do this without the higher price of new gadgetry. Some like Google's Nik are free. Others like Topaz Labs go even further. And Photoshop Elements 15 as far as easy to master ones that don't cost a lot. This is not the future for most of us, it is only the future for people who don't want to learn photography. They just want better snapshots of their kids! They should listen to the Two Hosers Podcast instead (it's cheaper and funny)! Making those choices myself is a big part of the creativity (and the fun) of photography. But.. but... this will "quickly shoot amazing images"! Nikon never claimed that. And I can confirm, that certainly not is the case with any of the Nikons I've owned/own. ".... and default autofocus , intimidated novices can quickly set up the Nikon D70s to function as a glorified point - and - shoot camera , with nary a control to fret over except the zoom ring , the shutter release , and the power switch . I switched from Canon to Nikon and I'm certainly glad I did! As the photographer 's comfort level increases , the camera can be switched to one of the Digital Vari - Program -LRB- scene -RRB- modes , which use a built - in database of thousands of shots to calculate which exposure , sharpness , contrast , and saturation settings best suit a particular situation ..."
"Matrix Metering or Evaluative Metering mode is the default metering mode on most DSLRs. It works similarly to the above example by dividing the entire frame into multiple “zones”, which are then all analyzed on individual basis for light and dark tones. One of the key factors (in addition to color, distance, subjects, highlights, etc) that affects matrix metering, is where the camera focus point is set to. After reading information from all individual zones, the metering system looks at where you focused within the frame and marks it more important than all other zones. There are many other variables used in the equation, which differ from manufacturer to manufacturer. Nikon, for example, also compares image data to a database of thousands of pictures for exposure calculation. " "What the camera does do is use the experience gained from professional photographers and analyzing many, many photos (that's your 30,000 number) in order to help program the camera's firmware to recognize what sort of photo you are trying to make. Once it has classified your image it then can make the best calculations for your exposure." "comparing what is sees against an database of over 30,000 images for unsurpassed exposure accuracy, even in the most challenging situations. By the time the 3D Matrix meter has made its considerations of colors by hue and saturation, tonal ranges by brightest and darkest, areas of similar tonality that are connected or separated, distance to the subject, and compared that to its database generated from photographic images, it’s got a very good idea of what the exposure should be. What is the database of over 30,000 images? Over the years Nikon has studied the color, area of coverage, focus distance, contrast, size and shape of shadows and highlights and exposure characteristics of over 30,000 actual photographic images and incorporated this data as a reference source for the expert exposure system that is the 3D Color Matrix Meter.."
@cosinaphile - Nikon was using millions of images. This is doing a similar thing, but apparently much more? IE, Nikon (and everyone else now) was focusing on correct exposure only. This thing seems to take more than just exposure into account and give you options like motion blur etc. Not something I find all that enticing, but he's a smart guy. Looks like a product he can be proud of. HMMmmm.... so they've re-invented "iA Mode" for lots of extra money. The only camera "settings" are aperture, shutter speed, selecting point of focus and ISO. Unless one wants to include flash units, locking mirrors, IS, filters, a tripod or in-camera image editing, like HDR, or some other app to achieve a preferred "look" (and, of course, cameras with tilts, swings, rise and fall), aperture, shutter speed and focus point are about it. No matter how many sample images are analyzed, no AI program can pre-select the location, choose a subject, determine camera position, find a perfect time of day, wait for the desired lighting, or any of the many choices necessary to create an image that expresses a particular vision. Perhaps a workshop with a great photographer would be best. They can take you to their favorite spots at the right time of day, tell you where to set up, pick a lens, etc. etc. This is why you do what you do, and this guy does what he does, he is a robotics engineer. take away the fun element of photography and what do you have left? Very interesting product from some creative thinking. Using a plethora of online shots for AI to reference and figure out what to suggest as far as setting to mimic those shots is genius. A perfect example of how AI will replace many jobs as it learns how we make decisions and applies that knowledge. There is really nothing this app does that someone couldn't learn from reading books and learning from pro's blogs etc. Just makes it simple. I think it's an excellent idea. soon: senna mode for my golf..
you want your golf to drive into a wall why oh why would anyone want Senna mode. All you whinners will be the first in line to purchase​ this tech if and when it becomes available. No Olympus support, and most of that is already built into the Wifi mode. So... *shrug* also as someone pointed out earlier Nikon 'trained' their 3D Matrix metering with 30,000 images a few decades ago, so this isn't exactly new just makes it more or less dummy-proof for someone with a smartphone. Seems like the AI portion, is a likely future development in Canon's fully automatic and even program modes... and the smartphone app is already available for the latest Canon cams. I like it... and would be interested, but for that I was burned for $1200 for an IndieGogo campaign for a comparatively simple led soft-box lighting system. It was plagued by manufacturing snafu's and lack of biz skills on the part of the owners, and finally defaulted and stopped responding to irate funders two years after the date promised. Won't mistake a crowd funded item for a shipping product ever again. If this goes to market, it's price will be competitive based on competing products, and I'll have another look. Might even be more affordable and come with a warranty. Original crowd funding ask was for US$50,000 and he got US$2.65 Million. I would consider this amount way above what would be required to produce several units and supply them to the press for reviews to further enhance sales of his product, in addition he went and crowd funded a further US$423,240 from Indiegogo. As a keen amateur photographer I am interested in this device but until I get reviews from the press and users, as a pensioner I do not have money to spare on fiction. Weighing up the price saving against something not even being shipped or paying a higher price later on I am happy to wait. What does this potential gadget add to the iA and iA+ modes that I've already got on Panasonic, Sony, Olympus and many other cameras? I must be missing something fundamental, because I just don't get it. Remote control, time lapse, and focus stacking. This may well be attractive to some (perhaps the same people who want self-driving cars, or like eating frozen dinners and pop tarts). I would have thought that people who spend the extra money to buy a manually configurable camera with which to experiment (to see what it takes to achieve different effects) wouldn't be all that interested. If however customers want to buy the product, it won't matter what people like me say, will it? I am all for self-driving cars when commuting. But pop-tarts? Frozen dinners? yech. Great photographs are not made by knowign which knob to twiddle , slider to scoot, or button to push, but knowing when to push that button, what and to put between the four edges of the frame and where to put it, and to have the imagination to see things in a new way even to oneself. I'm with you when it comes to frozen dinners and pop-tarts. Not a fan... but accept that some are. Ellis Vener.. you have oversimplified. Yes, when you push the button and how you frame are essential.. but how you expose the sensor, which ISO you use.. freezing motion with a higher shutter or not, depth of field with your aperture etc etc.. this is photography. The question is if the result matter or the way of doing it matter. One day the IA may very well do it better than the most the population, including most people here. Factories already do that for most things. No way you would make by hand an iphone or even a tie with the same finish as what machines can do. After all, high end camera focus better than most people and track moving objects better. They are better at evaluating exosure and WB. Tomorrow they'll be better at choosing the right speed and apperture... And a bit latter, drones will choose the right time/framing/angle of view automatically. The basis of all things, of all that make our societies is that thanks to specialization we can do more with less effort and so get more in the end. Having an interresting life is about choosing what you should delegate to others and what you choose to do and experience yourself. When to go for a walk or when to take the car... or the plane. With this device I can turn my Sony a6000 into an iPhone camera with a good sensor and interchangeable lenses, but... There goes the challenge AND fun of making creative and technical decisions myself. In other words, I will no longer be a photographer. And you will no longer take crappy shots, because each shot can not be taken twice, you all sound like the Holly Grail of photographers in here, which most of you are not. If this works out the way it says it does, it will help kick start the DSLR market back into gear, it has been hurting for some time now. Technology moves ahead people not backwards. Given the comments found on the "Most popular (15)" tab, your use of the phrase "you all" is appropriate. Seriously, LMAO, you will no longer be a photographer, of course you will, you still have to see the canvas, frame it and press the shutter button, it's not like you are no longer going to be a brain surgeon. You're right - a chimpanzee can't be a neurosurgeon, but he can certainly take pictures with an Arsenal-equipped DSLR. I think there are few apps that can do same as this device . Then of cause , if your camera doesn't have WIFI and you're not ready to work on your skills - pay the man . This is not what you think it is. This will change the game, I see many pros in here crapping bricks with their negative comments. This device comes to be upgrade for cameras' Auto mode . Well , many DSLR\SLR shooters buy DSLR\SLR exactly for the sake of having more manual control over the body and the shot , but sure it is not completely useless product . You have to ask why would some scam artists have better technology then Canon and Co.
One should never present a kickstarter project as something that will become a real product. These projects are some sort of fantasy and will never exist. 90% of the kicksarter tech projects fail in one or the other way. I lost 100s of Dollars on kickstarter. with lame idea, draw a box with some holes on paper and go to China and expect that they can siphon off all the profits and let the Chinese company do all the risk taking, research, development, manufacturing, testing and management for a penny for them. What comparable technology have you seen from Canon, Nikon, Sony, it any other DSLR manufacturer, I haven't. I hope this pans out, since the DSLR market has gone stale. I see quite a few pros in here crapping their drawers, reason for the negative comments. "What comparable technology have you seen from Canon, Nikon, Sony, it any other DSLR manufacturer, I haven't"
A system that "chooses ideal camera settings for a particular scene based on what it has learned from thousands of similar existing photographs.'? Ert, aren't they describing the basic claim of Matrix metering? No, this is NOT the same thing. And we know this, because?? Their statement matches Nikon's original claim of the development of Matrix metering, on the FA, rather precisely. I thought we already had this in auto mode? Don't dis this as a stupid idea. If it can actually leverage the knowledge 1000s of pictures and actually do something useful these people will prove themselves so they can sell the tech for top top dollar to big photo. If they try to sell to big photo directly they will get almost nothing and only one brand will have it. I hope they can deliver, but I can't really see how.. A good photo is only 20% about settings. Nikon and Canon cameras already have this programmed into their cameras and have been doing so since at least the early '90s. in a way that is true statement. it;s the database of previous exposure scenarios that form the basis for evaluative RGB metering processes that take into account things like color, focusing distances, exposure times, lenses, flash vs. no flash, etc. . Nikon and Canon (and presumably Sony, etc.) send out photographers to shoot in all sorts of specified and unspecified scenarios and the engineers back at HQ build databases which are programmed into the cameras firmware. But they don't take over your camera, just suggest exposure solutions. Wow, just what photographers need. God knows photography was still way too difficult for the average person before this. The negative comments you see in here is from pros crapping their drawers. Quite frankly I think this is if not doa then not far from it. If it is considered helpful, then what keeps Nikon, Sony, Canon, etc. to reengineer the software and implent in the camera? If it is not good, then why should the big three worry? The best thing the developers can do after they have delivered their promised units is to sell the software to one of the camera makers. Why should they do that, I wouldn't, why sell it to one manufacturer where you can sell it to the masses who use gear from every manufacturer. Photography is an intuitive process. Becoming a craftsman means knowing how to get there, Not letting some program design it for you. What have you really learned about photography if you let this happen without your input. I for one am against this and tell everybody to learn the craft, thereby creating your own style. Use the best computer in the world – your brain! No machine will ever create your essence. To me this takes the enjoyment out of photography and makes everybody the same. Art is not meant to be a program. Like I stated in a few of my other posts, you sound like a Pro that is crapping in their drawers. This is about getting the right shot the FIRST time, which means saved time, which means more time for more shots. I am sure you are the holy Grail of photographers and never missed a shot or crapped a bunch of them. Seems like there are benefits outside the AI, but if the AI part were to actually magically guarantee great photos (insert intense skepticism here), it kind of loses the whole point of photography. The object is not to collect great photos, the object is to create great photos that *you* took. It would be a bit like buying Watson, having it win every game of chess with your friends, and then declaring what a great chess player you are because you bought Watson. I think we need to step back and remember that technology is the means, but the betterment of human condition (enjoyment, quality of life, love, family, relationships, community, etc.) is the end. Having more stuff like iPhones is not progress, having stuff like iPhones that help us all live better and more fulfilling lives *is* progress (and I would note, not having more stuff like iPhones and all being happier would be progress too - there is life outside of technology). But individuals are free to choose what matter to them and live their life accordingly. For some it may happen they want to take photographs with exactly the amount of automation we have in today cameras. So the camera can take thousand of photos, track objects accurately and focus properly, select a good enough exposure so that you can just alter it a bit in post and so on. Or maybe people prefer the more automated auto/scene mode available in most camera, while some other prefer film and MF lenses. I don't know many that still don't trust their camera metering and use the f/16 rule instead. Anyway, taking photos is only a single possible activity in the grand schemes of life and what people can do with their time overall. Nobody did it just 200 years ago and I hope it could have been said they had fullfilling life anyway. It may be very well that nobody would do it the way we do it today as almost nobody does it how we did it 100 years ago. Darn it! I was hoping to spend some time learning photography before it became to pointless to learn! JUST A THOUGHT would you or the device own the copyright? Does Canon, Nikon or Sony own the copyright of your photographs now? The beginning of a universal menu system.for all cameras! With more development, this can be very useful for those with cameras from different brands and for those who switches systems. The AI is also useful to provide settings that are a starting point, so that photographers can override or fine tune if they want, but can rely on for quick shooting when there no time to think. Just need some more control overrides than mentioned. Maybe also a way of feeding one's own photos into its database to personalise with odds one own style. If you combine this with a drone you don't even have to be there to take the picture! awesome.